An intrepid rescuer, clad in a seaman’s oilskin garb, and a swooning maiden, unprepared for the elements and limp in his arms, are thrust together by calamity. A blank sky with a threatening storm cloud heightens their isolation. We wonder where they are headed: at what or to whom does the hero direct his gaze? In his Study for “The Life Line,” c. 1883, Winslow Homer places his protagonists on a white sheet of paper, separated from what we imagine their surroundings might be. The lack of a detailed setting urges us to focus in on the intimate coupling at the points of connection – the rescuer’s thumb grazing her breast, his other hand cupping her soft shoulder and supporting her head, and the contrast of his sinewy, dark forearm to her thin, white garment. Homer’s drawing allowed the artist to work out the important aspects of his figural grouping in preparation for the final painting, now in the collection of the Philadelphia Museum of Art. 28 5/8 x 44 3/4 inches (72.7 x 113.7 cm). The George W. Elkins Collection, 1924. The only distraction for the viewer from the two figures is the breeches buoy that connects them. This device, a life-preserving ring with integrated short pants, moves by a block along a life line during ship-to-shore rescues. What is omitted in the study and, indeed, mostly omitted in the final painting, is the rest of the narrative. Like a photographer viewing a scene through a telephoto lens, Homer is creating his own “zoomed in” representation of a life line rescue. 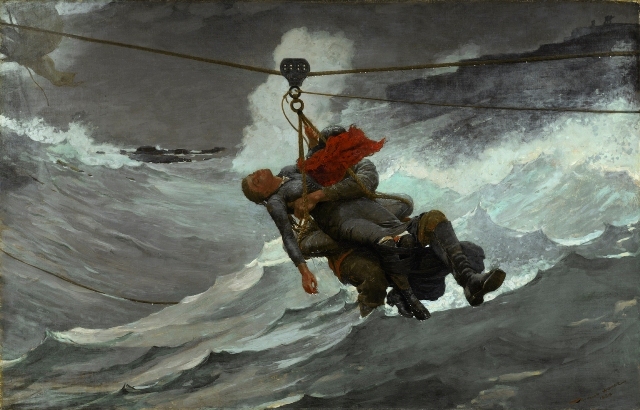 American pride in the developing professionalization of the U.S. Life-Saving Service (USLSS) during the last half of the nineteenth century inspired many artistic representations of sea rescue. 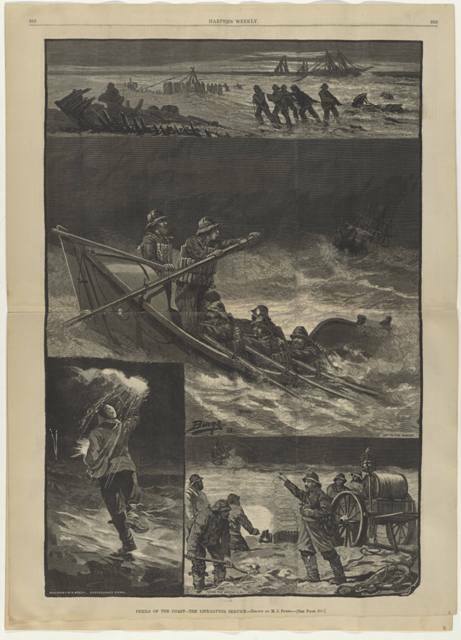 Conventional renderings for popular periodicals of disaster response and frequent brigade drills attempted to embrace the full scene – the shore, the ship, and the rescued – thereby calling for an unsatisfying long distance view. Page from Harper’s, April 16, 1881. In contrast to depictions that leave much in the way of human drama to the imagination, Homer’s close-up perspective enhances the connection between viewer and victim and allows us a rare intimacy. Homer was no stranger to the thrill of sea rescue. After his stay in Cullercoats, England – a village at the forefront of life-saving technology – he traveled to Atlantic City in the summer of 1883 and befriended the USLSS men there, perhaps seeking an analogue to scenes he had grown accustomed to in England. He took the idea for The Life Line back with him to New York, where he started work on the painting, and subsequently to Prouts Neck, Maine, where he finished the picture. On the rooftop of his New York studio, Homer supposedly drenched his models with buckets of water in an attempt to faithfully reproduce a scene of two ocean-soaked figures. The finished nature and fine details of the drawing attest to the hard work accomplished in the studio setting. Ultimately, Homer made alterations between the drawing and the final painting. Most notably, he obscured the face of the rescuer, thereby directing attention to the maiden. Cloaking the hero’s identity allowed one lifesaver to act as proxy for the unseen brigade of onshore heroes pulling the couple to safety. The painting hints at the remains of the ship and the direction of the shore, elements wholly absent from the drawing. The innovation Homer brought to depicting a life line scene as a union of two strangers is perhaps even more evident in his drawing than it is in the resultant painting. For an in depth study of The Life Line and its artistic precedents, I encourage you to take a look at Kathleen Foster’s exhibition catalogue Shipwreck! Winslow Homer and “The Life Line” for which I was delighted to serve as curatorial first mate! Margaret Adler researches and writes about historic American art and popular culture. She was the 2011-2012 Barra Foundation Fellow at the Center for American Art at the Philadelphia Museum of Art. Drawing: The Life Line, 1882–83. Artist: Winslow Homer. Gift of Charles Savage Homer, Jr.. 1912-12-34.